saw this one this afternoon. this is also a white glove services truck, from what it says on the box. Those graphics go back a while. There was a time when White Glove Services trucks and contractor uniforms were specifically designated. I do not recall any announcement but at some point, the White Glove designator was dropped and all FDCC trucks and uniforms were branded alike. As you know, the new FDCC logo is now red. It will take several months to change over the fleet. yea, i noticed some strange custom critical stuff yesterday. saw a truck that had a ghost image of the panther logo on the box, and just had the fedex logos on the door, not even on the box. i knew about the change in colors, thats why i thought it was odd to see a truck still running around with the old colors, i've saw trailers in the new colors but nothing else. A lot is going on relative to the logo change from FedEx blue, as we called it at FedEx Custom Critical, to FedEx red. The company is paying the cost of removing the old graphics and putting on new. - Some contractors rushed right in to have the change made. - Some are waiting for a convenient time to get it done and may never get it done until FDCC puts its foot down and sets a required date. - Some have strong feelings for the distinctive blue logo (FedEx Freight is also red) and are putting off the change as long as they can. 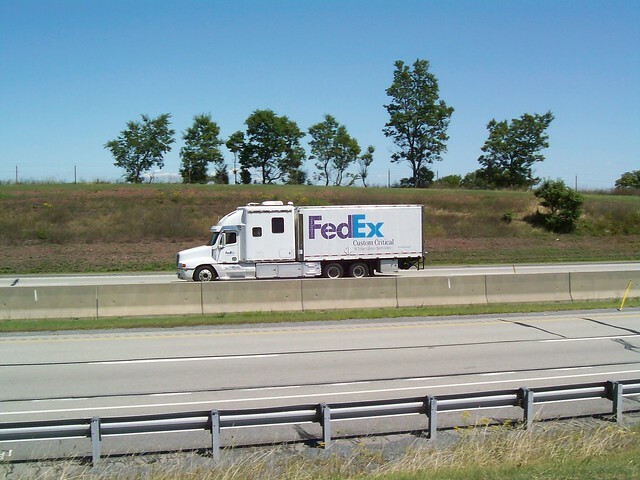 - Some resent the company changes that have happened since FedEx Freight (FedEx red) took over FDCC and are delaying the logo color change as a form of protest. - Some have either decided to change carriers or are considering doing so. They are not changing to FedEx red because the next logo on their truck will be that of their new carrier. - Some are exercising their option to display only the door logos while leaving the box white. That may be for a number of reasons. One of them is disgust with the way the old FedEx blue graphics frayed and peeled away at the edges. It looked like crap but the company would not pay to have new graphics put on. Word is that the red graphics are of better quality but time will tell and the people with white boxes may be giving it time to tell. Another reason is that white-box contractors have a carrier change in mind and the white-box option makes any move they may make in the future that much easier. - Some see the logo change as a good time to get their truck body painted and are taking the time to arrange the paint job with the logo change. That explains some of the white-box trucks you see. - All new trucks entering the fleet will be branded with the red logo, unless those contractors choose to keep their box white and go with the door logo only.